Boat Trailer Accessories | Boat Trailer Bow Stops | VE-VE Inc. 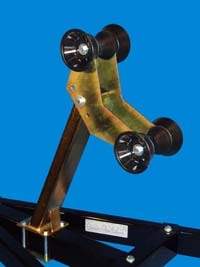 NOTE: These Bow Stops are QUALITY AMERICAN MADE Products, and you DO get what you pay for! T-990-16; "BOW STOP ROLLER ASSEMBLY." ( For 3" Wide Winch Post ). Comes with 4" wide Bow Roller with End Bell Roller Caps, Mt. Brkts & Fasteners. Mounts on to 3" Sq. & 3" wide x 4" Winch Post. Note: Rollers are actually BLUE, not black as shown. 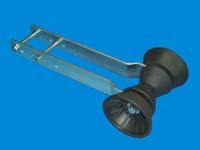 The Double Roller “Bow Stop” with 2" x 4" Heavy Duty Post, helps protect and secure boat when loaded and in transit. Note: Rollers are actually BLUE, not black as shown. The T-996-16; "Large Bow Stop Assembly" mounts to 4" WIDE winch post / stands or winch mount arm ( Shimming may be required for narrower applications ). 2 ea. 4” Bow Rollers with Bell End Caps are 13-3/4” apart ( center to center ) & mount on 2 ea. 7” H. x 16-1/4” L. x 3/16” thick laser cut “Bow Roller Arms”. Thier is 5 different height adjustments with a 6" range. 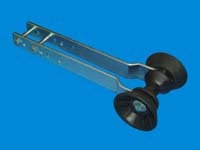 Bow roller arms are made of 3/16" thick steel.